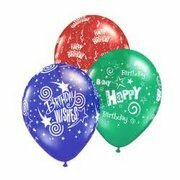 Order a 1/2 dozen 11inch printed balloon arrangement (with weight) to compliment your event. Balloons make all occasions that much more festive. Tell us your color choices in the "Customer comments" section. And ask us if we have a certain print you may be looking for. Pricing for these balloons includes tax.